Word cloud image above generated by asking 100 people at our events: ‘Please describe Creative Dundee in three words’. The larger the word appears, the more it was proposed. We are always keen to know how we and the rest of the city are doing in providing useful events, resources and support for creative communities in and around Dundee. 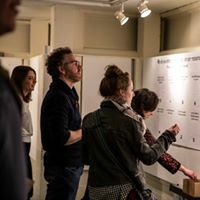 That’s why at our recent Make/Share and Pecha Kucha Night events we asked everyone to give their feedback on what Creative Dundee currently offers, what we can improve in future, and what support would make people stay and thrive in Dundee. 100 people took part in this, and provided us with really useful information, and we wanted to share these findings with you. Gaining feedback can be tough, and we wanted to make sure we asked for thoughts in interesting and interactive way! We were inspired by the Live Audit we designed and produced in collaboration with Creative Edinburgh during last year’s Mass Assembly forum at Dundee Design Festival 2016. The Live Audit is a useful tool for people to share their insights and ideas instantly during events. A big thanks goes to everyone who took part, we hope you enjoyed taking part and that you also find the feedback useful! Pre-event: Some questions were asked in advance through Eventbrite when people booked their Pecha Kucha Night tickets, and then the results were shared on the walls at the two events. This info helps us know how and why our community is engaged. 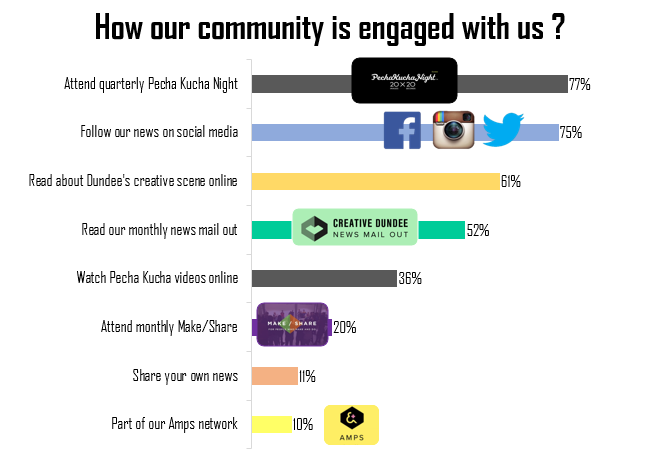 It was really interesting to see that you’re engaged with us in many ways, mainly coming to Pecha Kucha Night quarterly and following us on social media. During event: We asked questions about the things we offer and how could we improve them in future. It was good to see that the biggest impacts people gave were: raising awareness of what’s happening in Dundee, creating a community, and giving inspiration to help develop skills and capacity. This is totally in line with our mission and we hope to increase our impacts future, taking into consideration your suggestions of more events, new types of connections and new types of support. Another set of questions considered the future of Creative Dundee and of the city: what should we and the city do to to help a sustainable creative sector? The majority of people said that they would like us to promote the good things happening in Dundee nationally and internationally, particularly as Dundee is increasingly recognised as a creative hub and is a UNESCO city of Design. People also felt that creating collaborations with different sectors is important and would like to take part in more cross-connections. However, the results also emphasised that there is still a concern for the city to retain our talented creative people, showing a need for support for emerging creatives. These results are really interesting for us and we’ll definitely be taking them onboard in our future plans. Creative Dundee is leading a new strategy for the creative sector in the city, Dundee’s Creative Sector Blueprint 2018 – 2021, and this feedback will really help focus the future priorities for the sector. Thanks again for taking part in being interested in this research! You can read all submissions received by looking at the full report shared above, or visiting this link here.